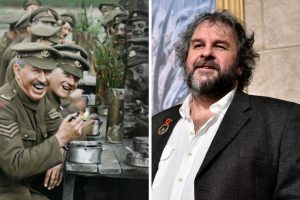 The World War I documentary produced by acclaimed filmmaker Sir Peter Jackson is up for a BAFTA next month for his new film which uses original footage from the Imperial War Museums’ extensive archive, much of it previously unseen, alongside BBC and IWM interviews with servicemen who fought in the conflict. Original film footage has been restored and transformed with modern post-production techniques here at Park Road Post Production and in collaboration with StereoD, to present never before seen detail in colour and in 3D. The film is a stunning and emotional experience for young and old audiences which is exactly what the director hoped it would be. 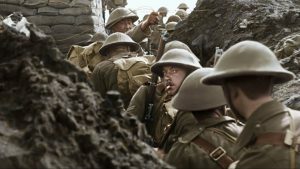 They Shall Not Grow Old is up for the 2019 British Academy Film and Television Arts (BAFTA) documentary award which was announced on January 9 and the award ceremony will be held on February 10, at the Royal Albert Hall in London. Peter will also receive the Governor’s Advanced Imaging Society Award which will be presented during the Society’s 10th annual honors ceremony January 30th at Warner Bros. Studios. It is Jackson’s first documentary as director, although he directed the mockumentary Forgotten Silver in 1995, and produced the documentary West of Memphis in 2012. Jackson, whose grandfather (to whom the film is dedicated) fought in the war, intended for the film to be an immersive experience of “what it was like to be a soldier” rather than a story or a recount of events. Over four years Peter and his editorial team worked with the Park Road picture and sound crew and reviewed 600 hours of interviews from 200 veterans, and 100 hours of original film footage to make the film. The title was inspired by the line “They shall grow not old, as we that are left grow old” from the 1914 poem “For the Fallen” by Laurence Binyon, famous for being used in the Ode of Remembrance. They Shall Not Grow Old premiered simultaneously at the BFI London Film Festival and in selected theatres in the UK on 16 October 2018, before airing on BBC Two on 11 November 2018 (the hundredth anniversary of the Armistice of 11 November 1918. It received a limited US release on 17 December but following its box office success now breaking records in the US for ‘event cinema’, the film will have a wide theatrical release in 2019. It was acclaimed by critics for its restoration work, immersive atmosphere, and portrayal of war, which has earned the director a nomination for the BAFTA Award for Best Documentary. Good luck Peter!